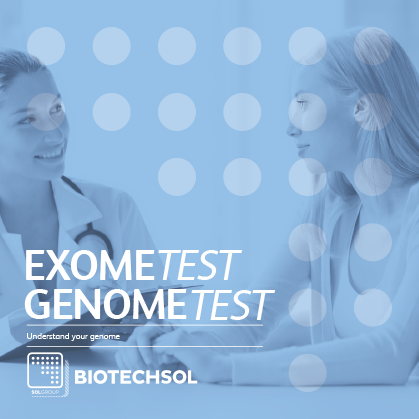 Genome/Exome is the DNA test intended for those who want to examine in depth the content of their genome. The analysis allows you to have access to a wide range of information related to your own health and that of your children. By choosing this product, it is possible to know if you are a healthy carrier of serious genetic diseases transmittable to children. Furthermore, you will get to know the personal genetic risks associated with common conditions such as cardiovascular diseases, tumors, neurodegenerative diseases, and so on; and to understand the potential response to certain drugs so as to define a personalized dosage with your doctor and to avoid adverse reactions. Knowing the health risks to which you are predisposed means that you can be prepared to face them and prevent them with the advancements of targeted medical check-ups, the change in your lifestyle or the adoption of preventive measures - such as specific drug or dietary regimens. Drugs response is strongly determined by the individual's genetic heritage. Being aware of the effects of taking one, and of the dosages needed to make it effective, can lead to the prevention of serious adverse reactions. Many drugs and their effects are related to a personal genetic profile. Therefore, this test is the key to select the best “tailored” cure with your doctor. Carriers of serious genetic diseases are typically healthy individuals completely free of symptoms. Nevertheless, they could transmit them to their children. The Genome/Exome test includes over 1600 transmittable genetic conditions; knowing that you could be a carrier of one of these diseases can, therefore, avoid their transmission to your future children. Although most of the genetic variability associated with diseases is localized in the exome, the whole genome sequencing provides a wider coverage of the mutations, and allows a more complete analysis of the human genetic code. In any case, the Genome/Exome test must be requested by a doctor.